There is no topic more polarizing than blockchain at the moment. One camp believes it will revolutionize every sector while the other camp thinks it is nothing but a fad. I’m personally interested in the combination of digital tokens and blockchain in creating virtual continuity, which sounds like a fundamental breakthrough. However, people are giving tremendous weight on the crowdfunding part of cryptocurrencies, giving scant regard for the real power of blockchain. 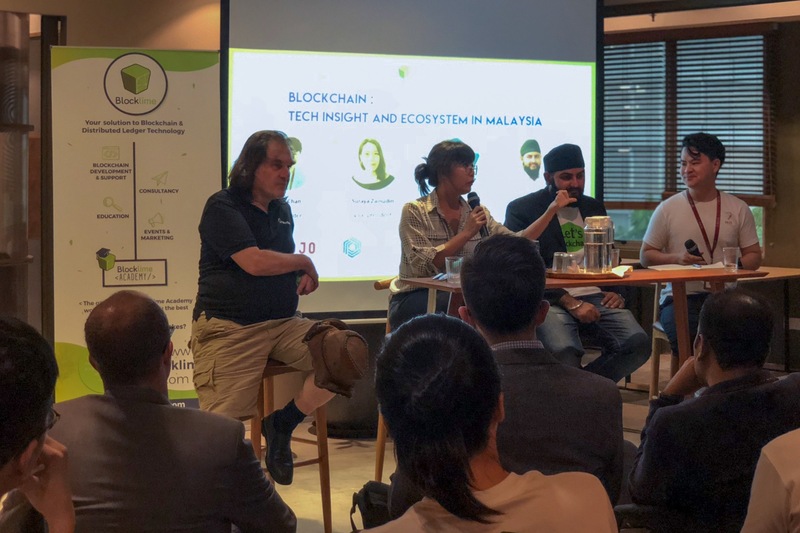 So, when I was given a chance to moderate a panel discussion on the blockchain ecosystem in Malaysia, I set out to investigate the local ecosystem’s needs at this very moment. The panelists were from HelloGold, Access Blockchain Association Malaysia, and Blocklime, which all have their hands in the local blockchain ecosystem. Here were the three key takeaways as it relates to what the blockchain ecosystem in Malaysia needs right now to grow. (L-R) Dave Appleton, Suraya Zainudin, Harpreet Singh, and the author. ICOs used to be very community driven, with technically-sound people investing in them. But it has grown to a stage where they are attracting more mainstream investors. Unlike other cities, Kuala Lumpur is fragmented, having scattered centers of influence. To combat this, Appleton thinks there needs to be more medium-sized community events so proper education and meaningful sharing on the use cases of blockchain can be done more frequently. Suraya Zainudin (vice president of Access Blockchain Association in Malaysia) highlighted the need for cross-pollinating different communities. “We need to see more leadership from the blockchain industry players, and we also need blockchain personalities that appeal to various subsets of developer communities,” she opined. Unless there are more core characters in the industry that can lead cross-community mixing, it would be highly unlikely to achieve critical mass for the development community. Just like how auditors and certain government agencies serve as checks and balances to traditional fundraising platforms, there’s a need for more blockchain tech talent to provide transparency and growth to the ecosystem. The motivation for this is pretty straightforward. In this day and age, regulators are often playing catch-up when it comes to understanding new technologies. By having more people that understand the technology, the ecosystem gains more eyes that will discover problems, build potential solutions for them, and evaluate proposals for effective policies. To begin with, Appleton thinks certifications for courses and recognition from certain bodies like the Access Blockchain Association could help clear the air, enabling students to choose more wisely. For the ecosystem to have a virtuous cycle, there needs to be a supply of new tech talent and more tech discussions. Emphasis needs to be put in educating the market that cryptocurrencies are just one part of blockchain. Governments or service providers can play a pivotal role by giving their citizens digital identities. Over time, legally binding digital signatures, passports, licenses, and ownership documentations can be built on that foundation. The most ambitious step in this direction is India’s Aadhaar national identity scheme, which has enrolled over a billion citizens. Visionaries see an entire “India stack” built on this foundation, possibly extending into payments for the unbanked. While it’s relatively unknown whether Malaysia could take this route, the possibility is there if the power of blockchain is fully utilized. According to Appleton, blockchain could also be used for humanitarian aid. The World Food Programme (WFP), for example, has transferred US$1.4 million in food vouchers to 10,500 Syrian refugees in Jordan using Ehtereum technology. Their cashiers wore iris scanners and settled payments by verifying data with other databases. “This significantly reduced the possibility of middlemen meddling with the relief efforts,” Appleton explained. While skeptics would argue that the only real use of blockchain has been to facilitate illegal activity via bitcoin, we are still in the beginning stages of this foundational technology. The primary use and even the values of the people using new technologies and infrastructure tend to change drastically as these technologies mature. This will certainly be true for blockchain technology as more people discover the technology beyond the coins. However, continuous hard work from different stakeholders is required to sustain and grow the local blockchain ecosystem in Malaysia in the right direction.